Is there a reason to care about tragedy in the life of a man who does everything possible to undermine all his opportunities for happiness? Paul Giamatti works hard to create a flawed character worthy of sympathy. Giamatti's performance is flawless, but ultimately, Barney is such a brilliant architect of his own failure that his misery is not sad; it's expected. 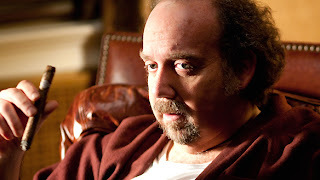 Barney (Giamatti) is a chain smoker, a heavy drinker, and a hopeless womanizer. As a young man in Italy, he marries a woman after taking her word that she's carrying his child. It turns out that he's not the father of the still-born baby; he immediately abandons his wife and she kills herself. Moving to Montreal, he inherits a career as a producer of cheap television series and finds his second wife (Minnie Driver), who is attractive, rich and well-educated. And on that wedding day Barney starts uncontrollably lusting after another woman, Miriam (Rosamund Pike). While wallowing in the misery of being married to one woman while chasing another, he carelessly handles a gun while drunk, unintentionally causes the demise of his best friend. He celebrates his second wife's infidelity since he can now more easily dump her. Although otherwise an intelligent career woman, Miriam eventually and inexplicably falls for Barney's obsessive courtship, and becomes his third wife. She really has no right to be surprised when he eventually starts spending his evenings fueling up on beer and watching hockey games down at the bar instead of paying any attention to her. After having spent half a lifetime pursuing Miriam, Barney takes the first opportunity to cheat on her. Of course Miriam leaves him and he ends up lonely, miserable, and fighting a losing battle against dementia. Perhaps all that alcohol killed a few too many brain cells. Dustin Hoffman makes a welcome appearance as Barney's father Izzy, a retired cop. There are hints that Barney is only accentuating the self-defeating habits inherited from Izzy, but director Richard Lewis, adapting Mordecai Richler's book, does not explore these themes in too much depth. Bruce Greewood as Blair, the man who eventually provides stability for Miriam, is by far the most normal man in the movie. He is portrayed as steady to the point of boredom, opposite Barney's self-absorbed but colourful life. Rosamund Pike is luminous as Miriam, and her performance may allow her to achieve a rare feat: a former Bond girl (from Die Another Day) who transitions into a respectable career. People who help themselves are worth pulling for; instead, Barney is a man who has a special talent for repeatedly pushing the self-destruct button. We watch more with bemusement than any genuine caring.